Stating categorically that the U.S. military attack against Libya on April 15, 1986, did not occur in a vacuum, this well-documented book gives an account of the context in which it did occur. Tracing the attack's origins, emphasis is placed on Qaddafi's domestic and foreign policies as well as his personality and motivations. The history of U.S.-Libyan relations from the Nixon administration to t… he collision course under the Reagan administration is covered together with the quiescent approach of the Western European allies. Davis presents a thorough discussion of the Rome and Vienna massacres and The March 1986 clash in the Gulf of Sidra. The closing chapters treat the final days leading to the attack: the LaBelle Discotheque bombing, the U.S. decision to attack, preparations, the military operation itself, and its aftermath and consequences.According to the author, the U.S. military attack on Libya marked the culmination of America's frustration over years of terrorist attacks without reprisal. 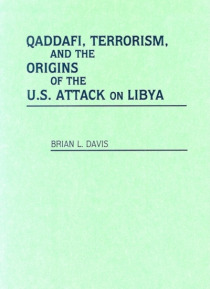 Davis traces the origins of the attack from the beginning years of Qaddafi's rule up to the April 15th raid. The book's detailed account demonstrates that Libya was not an arbitrarily selected target but rather a logical one. Students and scholars of political science and military studies, or anyone interested in the events surrounding the attack on Libya will find this concisely written and well documented book a source of great interest.